In this special extended episode, Phi Beta Kappa Secretary and CEO Fred Lawrence invites two experienced colleagues to a frank discussion about the unfolding college admission scandal that has rocked higher education. There are no easy answers, and responsibility is spread around generously, but the exchange is one that will certainly spark discussions at home, in the classroom, and in vaulted academic halls around the country. 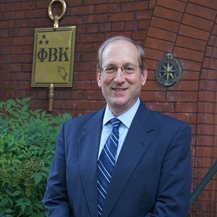 Key Conversations with Phi Beta Kappa is a new podcast featuring in-depth conversations between Fred Lawrence, Secretary/CEO of Phi Beta Kappa, and Phi Beta Kappa Visiting Scholars. With a new episode released every six weeks, each podcast invites listeners to take a seat at the table to learn more about the featured Scholar's background, research, and how they have taken their respective paths to where they are now, and where they are headed. Frederick M. Lawrence is the 10th Secretary and CEO of the Phi Beta Kappa Society. An accomplished scholar, teacher and attorney, he is one of the nation’s leading experts on civil rights, free expression, and bias crimes. Learn More. Use #PBKKeyConvos to share your thoughts and join the conversation.